Montpellier is certainly a popular study location for students – out of a population of 350,000, 70,000 people in the city are students. Additionally, 43% of the Montpellier population is under 30 years of age. The city is ideal for students, with living costs priced at less than 40% of living costs in Paris. The weather is likely to be warmer than Paris, too, as Montpellier enjoys mild winters and summer temperatures of around 40 degrees Celsius. The university trains students to become management professionals with skills that are looked for in employees both locally and globally. The international environment prepares the students for employment in multinational companies. In order to broaden the students’ horizons, students are encouraged to study at one of the university’s partner schools. The school has over 150 partner universities across 37 countries. About 300 students from those universities attend courses at Montpellier Business School during their studies (25 % are international students on site). The programmes include internships. 70% of graduates are recruited before graduation. 14,000 alumni are members of the alumni association. The employment rate among graduates is very high – 97% find a management position within 3 months after receiving their diplomas. Montpellier Business School is accredited by AACSB, AMBA, EFMD-EPAS. 35% of Montpellier Business School’s students don’t have to pay tuition fees. Have you ever been or are you currently a student at Montpellier Business School? If so, please tell us all about your experience by leaving a review below. We can’t wait to hear your story! Apart from the best diversity – there are students from more than 50 countries, __the subjects are unique and professors are excellent. There is guest faculty too who have a lot of real life experience about theories which we study in the books. So, we have the best of both worlds; Theory and practical examples. I did my last year in Bachelor degree and my Master’s Degree in Montpellier Business School. ____The experience was pleasant. __Firstly thanks to the International Office, for helping me with all the documents work for living in France; They saved my life…literally…__For the difficulties in my academic progress, I can reach all the professors easily on this campus, even those who are not in my program thanks to the open atmosphere in MBS__The pedagogic approach in Montpellier Business School is a combination of Theories and Practice; we share, we discuss and we complete. __Not to mention, in the south of France, we have lovely sunshine and the beautiful beach. I studied international business in MBS and I can say I was very happy with the international environment created for us – it made the course enjoyable and easy to understand. The school really helped to ease our integration, as if not, the language barrier would have made it really difficult. I am an exchange student in MBS and the truth is that for the moment is fulfilling my expectations very positively. Although I expected the highest level of the bachelor’s degree, I like how classes are taught. The teachers are very close and help you in what you ask. Especially the teacher of French Culture. I recommend this university. If you are interested in the world of business, it is a great university, with a very well qualified teacher and a wide variety of programs where they give a lot of importance to the practical and team work. Besides there are many exchange people, which allows you to know other cultures and meet new people because different activities for exchange students are organized almost every week. The facilities are very good and new. Teachers are well trained and involved with students. Good treatment and attention to international students who come from exchange. They hold events for students in a way that facilitates integration. I am currently an exchange student studying at Montpellier Business School. I find this university great for exchange students since there is a lot of diversity. This way you meet people from all over the world; you do not just learn academic stuff but you also cultural. The infrastructures of the university are quite good, especially the cafeteria and the fact that there are plugs everywhere. Another important fact is that this business school is ranked in the top 12 around France. If you're the owner or representative of Montpellier Business School - MBS, you can claim this University and build a better profile. 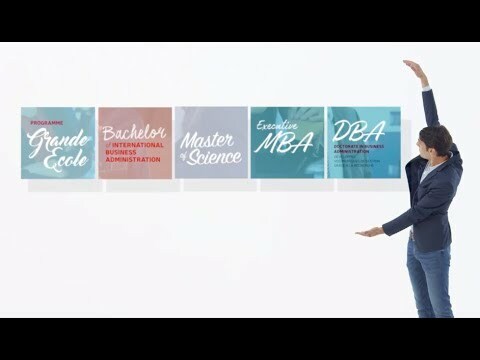 Interested in studying at Montpellier Business School - MBS?